European Garden Spider, Araneus diadematus.Spiders seem to be everywhere this fall. There are dozens of spider webs on my deck; each morning, I destroy a new web as I leave the house. It seems like every time I go outside, I wipe spider silk from my face. And it’s not just my yard—several of my friends have noticed lots of spiders recently, too. I wondered if we’re experiencing a bumper year for spiders, so I asked a few arachnologist friends about it. UC Berkeley professor Rosie Gillespie and her grad student Steve Lew identified my backyard spider as the European Garden Spider, Araneus diadematus. It is really common here in the Bay Area, and can be easily identified by the white cross on its back. These spiders aren’t especially numerous this year, although their numbers have increased over the past few decades. Initially from Europe, as their common name suggests, this spider appeared in the Puget Sound region in the 1970s. By the mid-90s, they were firmly established in the Bay Area. Araneus diadematus is an invasive species, an organism that is not native to the area and has a detrimental effect on the native organisms or ecosystem. 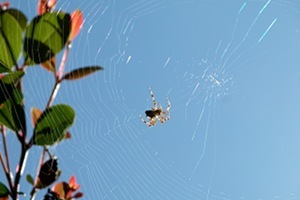 And, there are quite a few invasive spider species in the Bay Area. Another common invasive spider is Zygiella x-notata. They spin a very distinctive web—it looks as though a piece of the web is missing, as though someone has removed a single slice of pie. Other invasive spiders are actually displacing native spiders. For instance, the false widow, Steatoda grossa, is displacing the native black widow spider, Latrodectus hesperus. (This may not be such a bad thing, as the false widow’s bite, while venomous, is not nearly as harmful to humans as the real thing.) Another California spider, Theridion californicum, is being displaced by Enoplognatha ovata, which also hails from Europe. And, the native Funnel Weaver Spider, Hololena spp., may be facing some competition from the invasive Badumna longinqua, initially from Australia and New Zealand. Joe and I spent some time digging through the some literature on Halloween folklore, but we didn’t find anything that specifically links Halloween spider imagery to the seasonality of spider web-weaving. Halloween folklore buffs out there, please comment if you know of any connection!